For you regular readers, you know I am a fan of very simple style. I love the classic look of khaki and white. There’s nothing fussy about it- it’s such an easy and stylish outfit. However, it is possible to even screw this up! As you can see on the right- these cargo pants are cute- but like this they are a little boring, especially paired with this plain crew neck shirt. Blah! To add a little personality, I’ve added this gorgeous green necklace and my leopard flats. 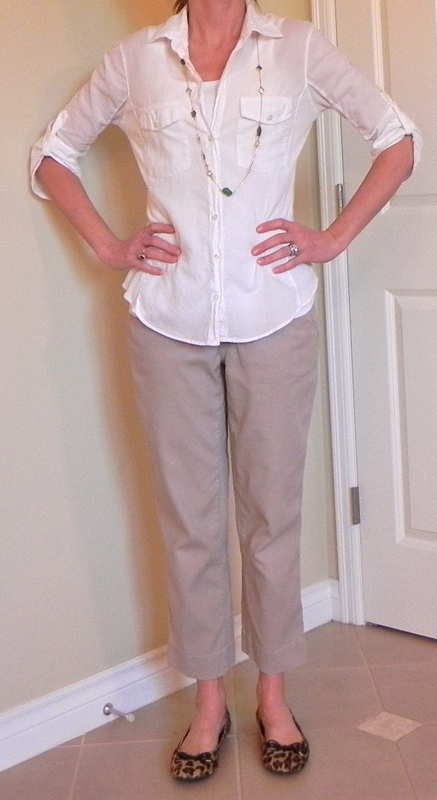 Again, nothing earth shattering- but a simple and casual mom outfit. White doesn't have to be boring. Just make sure there is something interesting about your outfit. I took all my photos for the upcoming week before I left on my vacation- which sure made for easy packing! And don’t forget to click on the link below to vote for my blog- I’m in the top 20, which is awesome! Thank you!!! seriously, you make it look so easy! LOL. that’s such a great outfit that looks like you aren’t TRYING too hard to have a great outfit. Like you just grabbed it out of your closet. Love it.